Loaliang is an island in Trang province. It's about a 2 hour drive from Ao Nang, followed by an hour boat ride. It is part of the national park which is a good thing, as this means no concrete and no 'permanent' structures. Instead you get a surprisingly luxurious tent (We did not know camping could be so decadent) and a series of bamboo relaxing areas. The island itself is small. 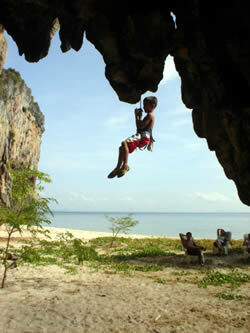 The area which you stay is made up of a long beach backed by limestone cliffs. 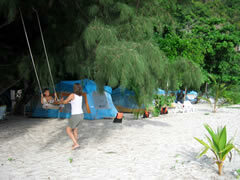 The beach is your classic white sand welcome to paradise beach, the water clean and warm. There is reef right off the beach, which means that it is not possible to swim at low tide (you can walk out but it's a long way). 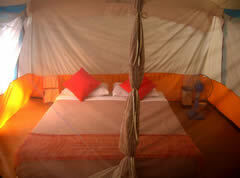 The tents are very luxurious, the bathrooms clean and nice. One of the nicest aspects of the place was not having to worry about anything. The island is small, isolated and self contained. 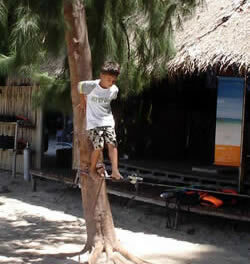 They provided climbing, snorkeling and kayaking gear. What was really nice was being able to just help ourselves to gear and kayaks at will. I'm a pretty disorganised person, and have an awkward tendency to leave my stuff lying around. Here it just was not a problem, If I stepped out of my climbing gear after a climb, it would be at the rock, just where I left it the next day. If I was reading a book, then the book and my bag would be just where I left it the next day. Perfect! We went early in the season, and so had the place to ourselves. Did I mention that the place was sandy, that beautiful white sand does get absolutely everywhere. They provide little foot washing tubs at the entrance of each tent. This at first seemed like a really nice idea. Then after a few nights of fumbling around in the dark, getting my feet nice and wet so that when inevitably I over balanced and put a foot down, perfectly coating it with a beach more sand then when I started, I began to hate it! There is nothing there except what is there, I know that is obvious, but there is no way to get off the island except when you leave. In other words it's pretty much a sellers market. That said, with everything already provided you don't really need anything.... I'd recommend several bottles of spirits- you can then just buy ice and mixers. Also anything you wish to smoke. If you like crisps and chocolate, bring that to. Then just the obvious like sun cream and a torch. 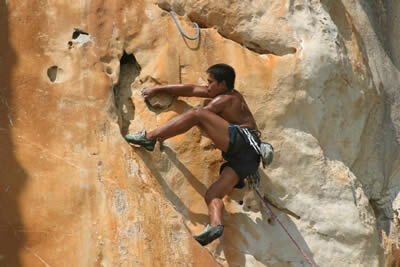 They do provide ropes, quickdraws and harness, along with a random collection of climbing shoes. If you've got your own gear with you, them I'd bring it. There is also a snack table where you can make yourself as much tea, coffee, water, toast and biscuits you can consume. On the beach there is a cool little bar. You can pretty much order up whatever drink you'd care to imagine while looking out onto paradise. With great tunes in the background it's pretty close to perfection! 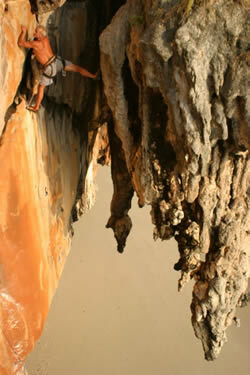 Steve has done some good climbing topos of Laoliang. The climbing here is still under development. There is already enough to keep you occupied for about a week. It was interesting climbing pristine rock. The friction was excellent, but there is allot of stuff to break or pull off. As a consequence I found myself a little cautious about what I pulled or stepped on. 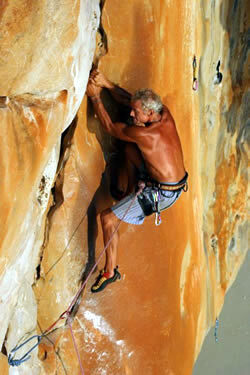 There are some absolutely classic lines, with grades running from easy 6a to 7b+. 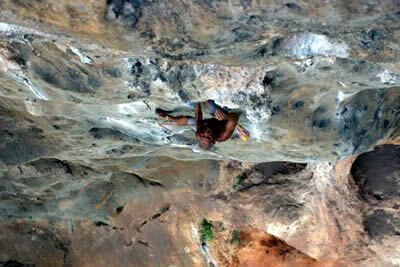 There are some good easy multipitch routes as well. When we went there was not much sand on the beach. This made for some interesting belays out of kayaks and up surprisingly hard to climb rope ladders. Apparently as high season comes, the currents switch around and the sand gets deposited on the beach, so much so that at low tide you walk to the climbs, and belay off of the newly formed beach (as shown in the first photo on the page). The bolts were all good as the climbs have only been recently put up. We were a little disappointed that they had not used titanium for everything, but alot of stainless steel glue ins. Should be good for a few years though. They also have these great chairs which come with your tent. It did not take us long to move these to the climbing area, where they provided an extremely comfortable belay. 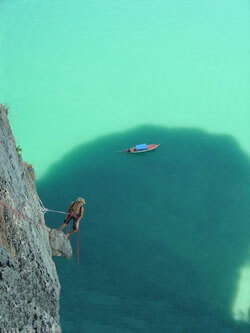 If you have a couple of weeks in Railay, then I would definitely go for three or four days. It's just too good an opportunity to miss, as who knows how long it will remain undeveloped. 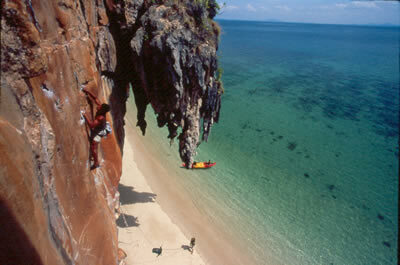 It also makes a welcome break from the high season madness of Railay Beach. If you only have a week in Railay, then I would not go, as there is more then enough in Railay/ Tonsai to keep you over occupied. How long to stay. Well as said, it's really a small place. We stayed for four days, which was probably about right. I should also mention it's a very child friendly destination. The advantage of booking from Tonsai, is that if you go with a group of 10 or more, you may get a better price. The disadvantage being that it may be full or the dates may not work out. Unfortunately as its a national park it's not possible to just turn up.